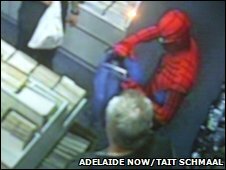 A comic book shop owner in Australia became a real-life superhero when he caught a robber red-handed. Michael Baulderstone, who was dressed as Spider-Man for a promotional event, spied a customer behaving suspiciously. CCTV footage shows him "leap" into action and confront the would-be shoplifter who had slipped a AU$160 (£97) X-Men book into his bag. Mr Baulderstone said customers at the shop in Adelaide thought it was a stunt until he asked them to call the police. 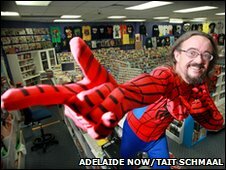 "We had about 40 people dressed up as their favourite superheroes to celebrate International Free Comic Day, so he [the thief] didn't have much of a choice but to hand the X-Men Omnibus back after a little bit of a scuffle," Mr Baulderstone told the Adelaide Advertiser. He said a group of Jedi knights blocked the door to prevent the thief from escaping, as The Flash looked on. "I've had a look at the security footage and it shows Spiderman running down the corridor of the shop, grabbing this guy, hauling him off," said the 45-year-old. "It was a bit serious at the time, but now we're looking back laughing at what greeted police when they arrived."